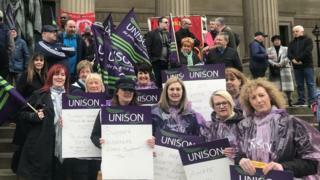 About 450 people have attended rallies in support of care workers on strike over pay, union Unison said. The employees, hired by the Merseyside charity Alternative Futures Group (AFG), support vulnerable adults who live at home across the UK. The AFG said council funding for sleep-in care did not "cover the costs" of minimum wages and called on the government to address funding issues. The government said it had provided local authorities with an extra £3.6bn. A Unison spokesman said some AFG workers could face an annual wage reduction of more than £2,000. "The staff are on low wages and are facing significant cuts to their incomes due to AFG's decision to reduce sleep-in top-up payments by £15 for each shift. "AFG are cutting the income of their staff despite there being no cut in the funding that they are receiving from the local councils who commission the services." About 300 people attended a rally in Liverpool and others were held across England. Emma, a care worker from Wirral, said the sleep-in payments were "a lifeline". "I've not been on strike before but I'm at my wits' end," she said. "I love the job I do and the service users. The care users' families have been very supportive." An AFG spokesman said the organisation, which employs 2,500 staff, was "extremely disappointed" with the decision to hold a 48-hour strike, which started at 07:00 GMT on Saturday. "The action is being taken by less than 10% of the workforce," he said. "The funding we receive from local councils for sleep-in care does not cover the costs to pay our support staff national minimum wage. "For the last four years, the charity has subsidised this shortfall to the tune of £8.1m but this is now no longer sustainable." He said social care funding was "in crisis", adding: "We urge the government to address the issue urgently." A spokesman for the Department of Health and Social Care said: "We have provided local authorities with access to up to £3.6bn more dedicated funding for adult social care this year and up to £3.9bn for next year". He added the government expected "care workers to be paid a fair wage for the important work they do". Workers who care overnight for disabled people used to be paid a flat fee of about £30, reflecting the fact that they may sleep during some of their shifts. In 2018, a Court of Appeal judge said "the only time that counts for national minimum wage purposes is time when the worker is required to be awake". However, most employers have started paying the minimum wage to care staff who sleep overnight while working.